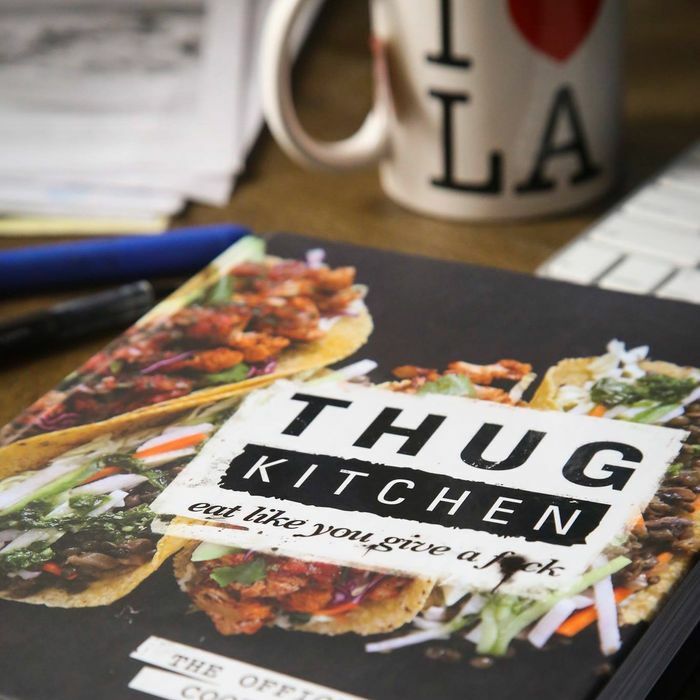 Michelle Davis and Matt Holloway, the bloggers behind the ultrapopular food blog Thug Kitchen, may have been accused of “nouveau blackface” for appropriating the word thug to help concoct their brand while they were still anonymous food bloggers, but none of this seems to matter all that much to cookbook buyers: The Rodale-published Thug Kitchen debuts at No. 1 on the October 26 Times Best Sellers list, and it’s currently No. 1 on Amazon’s list of vegan cookbooks — No. 7 in books overall, in fact. Controversy aside, it’s a major coup for an entirely meatless cookbook, and of course, the ascent makes it all the more likely that the Hollywood-dwelling, profanity-using, Gwyneth Paltrow-approved pair will be writing more cookbooks and soon enough will branch out into TV. Speaking of, here they are on Rachael Ray explaining that name. “I mean, we understand where people are coming from; Thug is a loaded word, and it’s definitely gotten a lot more loaded in the past year and a half in the news. But we’ve always intended it, to use it more as an attitude,” Davis says, before accidentally cursing on-air. Then the bloggers have to put $100 in the swear jar.